We all need more opportunities to laugh out loud, so I’ve gathered some more jokes by trawling the Internet just for you dear reader. I cannot be sure who wrote them originally but I’d be happy to credit the authors if anyone can identify them. 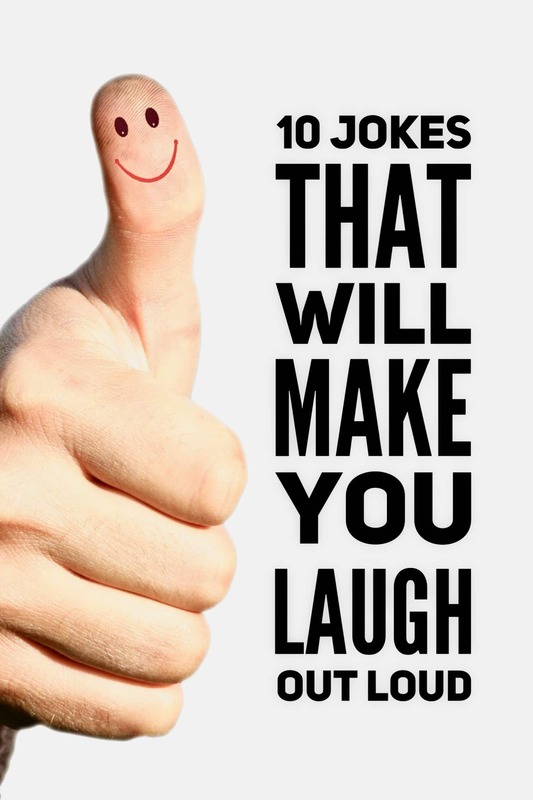 In the meantime, here are today’s 10 jokes that will make you laugh out loud. Certainly they made me smile. What do you call someone wearing a belt with a watch attached to it? Did you hear about the guy who broke both his left arm and left leg? Because he had a great fall. How can you get four suits for a dollar? Buy a deck of cards. Why didn’t the melons get married? What’s the difference between roast beef and pea soup? Anyone can roast beef but nobody can pee soup! What’s the difference between snowmen and snowwomen? 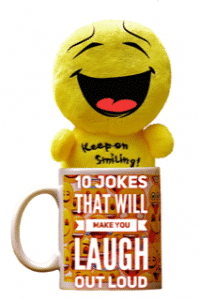 What did the bartender say to the drunk who walked into the bar with jumper cables around his neck? What’s the difference between a tire and 365 used condoms? One’s a Goodyear. The other’s a great year. Two men broke into a drugstore and stole all the Viagra. The police are on the lookout for two hardened criminals. So dear reader, was this post amusing and worth a few minutes of your time? 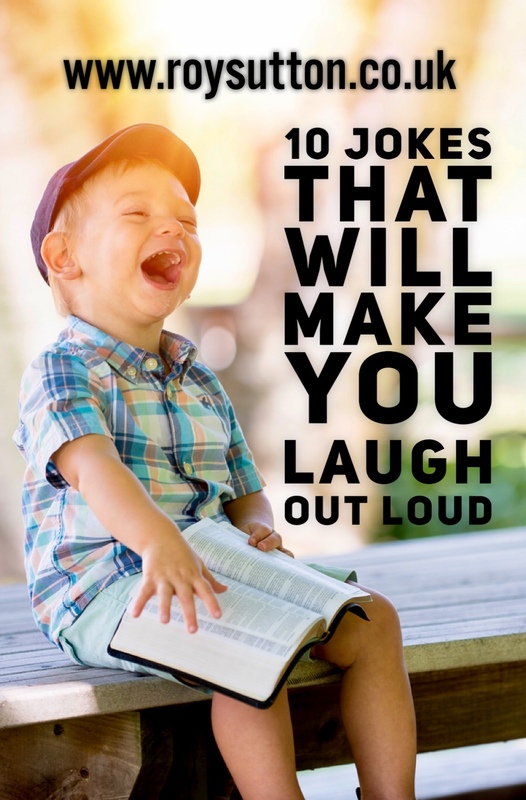 If any of these jokes made you smile then please share them with your friends on social media. When you share, everyone wins. It’s always a good idea to pass on the smiles. Put a smile on someone else’s face and you’ve done your good deed for the day. So go on, please share now. 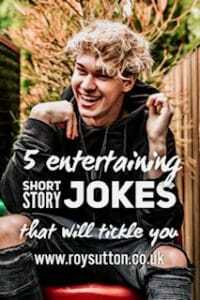 Then perhaps you’d like more laughs? Then just click on the links below. Emily was driving in her Chevrolet Bolt along the Interstate 17 in Arizona, on her way home to Phoenix. Suddenly she saw a poor, elderly Apache woman walking very slowly along the side of the highway. Recognising that this situation was quite dangerous and feeling sorry for the poor woman, Emily pulled over and offered her a lift. The Apache woman nodded silently in appreciation and climbed into the car. Naturally Emily tried to engage her in conversation but initially the Apache woman remained silent and she seemed a bit nervous. However as they progressed along the highway towards Phoenix the woman eventually started to relax a little and then she started to look around. The old woman was looking closely at everything in the car, apparently studying every detail. Then she noticed a pale blue gift bag on the rear seat behind Emily. “What’s in the bag?” she asked Emily, almost whispering. Charlotte had two young boys, Jack and Harry. Jack and Harry were two young kids who were always getting themselves into trouble. If there was any mischief happening anywhere in their town, then usually Jack and Harry were involved and Charlotte knew this. Naturally her boys’ wayward behaviour was a concern for Charlotte and it was an issue she was keen to resolve. One day Charlotte read an article in the local newspaper about a clergyman in town who’d been very successful in disciplining young boys and improving their behaviour. So Charlotte phoned the clergyman and asked him if he would speak with her boys. The clergyman said he was happy to help but he was quick to stress that it was important that he see each of them separately. So Charlotte decided to send young Harry to see the clergyman in the morning, with his elder brother Jack to follow in the afternoon. The clergyman was an enormous man with a stern face and a big, booming voice. The clergyman’s approach scared the life out of Harry. His mouth dropped open but fear prevented him from speaking. He just sat there wide-eyed, with his mouth hanging open. So the clergyman repeated the question but this time with an even sterner tone. “Where is God?” he said. Again Harry made no attempt to respond. He was too scared. That was it for Harry. He jumped up from his chair, screamed and ran out of the room and all the way home. He didn’t stop running until he got to his own bedroom and then he hid in his closet, slamming the door behind him. John had been undergoing tests for a serious health concern for several weeks. Finally it was the day for him to receive his test results. A guy walks into a New York diner with an ostrich. They both sit down at the counter and after a few moments the waitress asks them whether they’re ready to order. “The same,” says the ostrich. The man reaches into his pocket and, without even looking he pulls out the exact amount of money for payment. Once again when their order arrives, the guy reaches into his pocket and pulls out the exact amount of money to settle the bill. “Same for me,” said the ostrich. Once again the guy reaches into his pocket and pulls out the exact amount of money to pay the bill. “Well my first wish was that if I ever had to pay for anything, I would just put my hand in my pocket and the exact amount of money would always be there,” said the guy. The waitress was clearly impressed but still a little curious. “So what’s with the ostrich then?” she enquired. 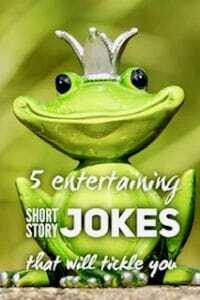 A frog goes to a fortune teller to find out whether he’ll ever meet his princess. “Let me have the good news first,” said the frog. “You’re going to meet her in her Biology class,” replied the fortune teller. If any of these short story jokes made you smile then please share them with your friends on social media. 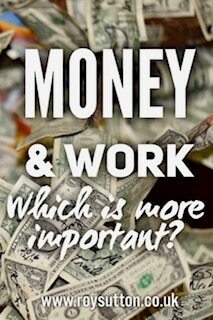 Money and Work: Which is more important? How often are we tempted to do something just for the money? Certainly I’ve done things for money alone and perhaps you have too dear reader? In my experience it’s always a mistake because no amount of money compensates you for the drudgery of doing something you hate. And more importantly, if you hate what you’re doing then you’re unlikely to do it very well, are you? It’s hard to feel motivated to do something you hate, surely? The message today then is very simple really. If you don’t enjoy what you’re doing, you won’t do it well. And if you don’t do it well then eventually you’ll come unstuck. And so it’s all going to end in tears, very probably. Conversely, if you actually enjoy doing what you’re doing then it will hardly seem like work and you’ll be motivated to do it very well. Do it well and people will notice and, once people notice, you’re career will start moving onward and upward. Every hiring manager wants someone with a track record for delivering results. So never do anything for money alone. Money is nice to have, of course, and we all need plenty of it. However life’s too short to spend it doing something you hate. Find a job that’s right for you first and then work hard to master your trade. Get better at it, become more valuable and then get as much as you can in terms of income. When you’re producing results make sure you’re paid what your worth. It should never be about the money but that doesn’t mean you should ignore your value and sell yourself short. 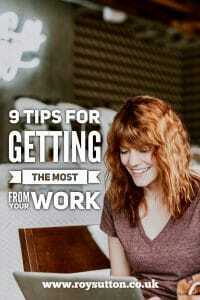 It’s about work and the value you can add first and then it’s about making sure you’re suitably rewarded. Be a dedicated professional but don’t be a mug. So please share now. If you do I will be ever so grateful and you’ll be helping a keen blogger reach a wider audience. If you’re looking for a little inspiration dear reader then you’re not alone. We could all use a little inspiration occasionally. I’m inspired by quotes from great thinkers and opinion formers. So I start each day spending a few minutes thumbing through the quotes books in my library. 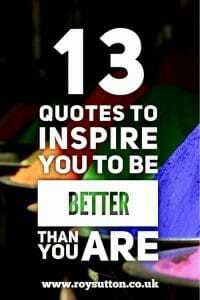 Here are some of the best quotes to inspire that I came across this morning. Enjoy them all. 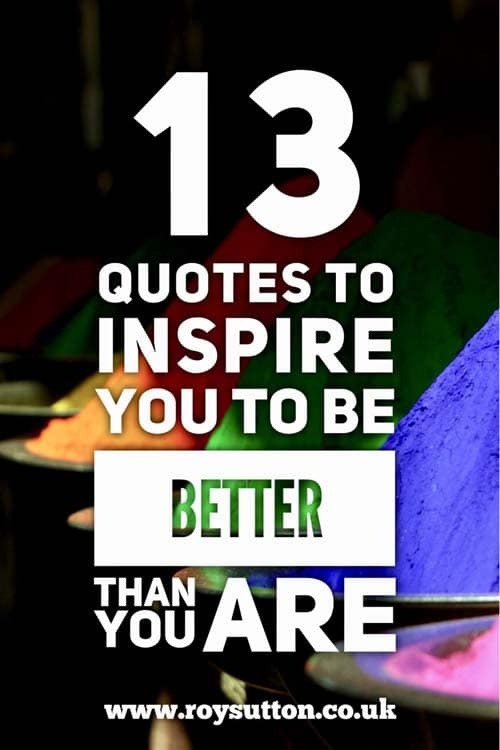 If you found these quotes inspiring and interesting then please share them on social media with your friends. When you share, everyone wins. So please share now. If you do, I will be ever so grateful. Do you feel valued by your employer? Now just think about that question for a second dear reader. However you have to ask yourself how many of them really mean it? The answer is few, if any, in my experience. Now to be fair, many employers probably think they mean it at the time such messages are circulated to the workforce. Staff in the Human Resources department may be genuine when they issue such statements. Nevertheless the reality is almost always quite different, however right on and trendy your employer tries to be. Rarely are employees truly valued by their employers. Most companies regard people as a commodity to be used when they’re useful and then discarded when they’re perceived to be no longer of use. Well for a start it means that you have to look after your own interests. If you don’t look after your own interests then no one else will, that’s for sure. If you think someone, somewhere is thinking about your best interests then, with the exception of your parents, then that’s unlikely at best. 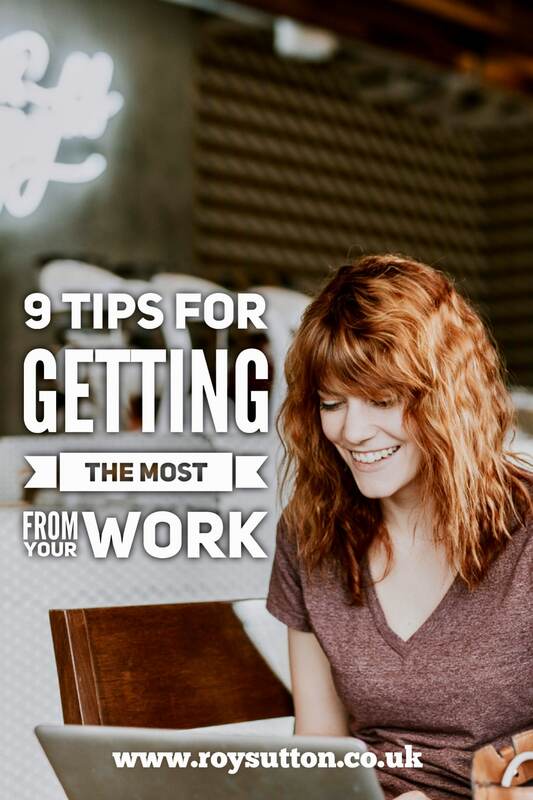 It’s all down to you to get the most from your job and your career. You must decide what you want; you must decide where and how you can add the greatest value; you must decide what’s the next logical move for you, in pursuit of your goals; and you must decide on the timing of when it’s appropriate to move. Occasionally you might get lucky and a great opportunity will fall straight into your lap. However that doesn’t happen often, if at all. Remember that you are the captain of your own ship. So you decide where it goes and you must steer it accordingly. It would be a mistake to rely on others to plan your career, quite simply because they won’t and it would be naïve to think otherwise. 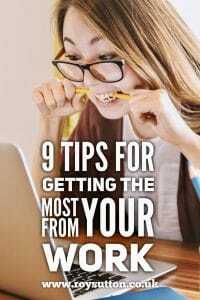 So today I offer you my 9 tips for getting the most from work. Now, reading this, you might think that I have a jaundiced view of companies and corporate life. Actually I don’t; this is simply a realistic and pragmatic view based on many years of experience. Work is just doing stuff for other people in return for money. If a company has stuff that needs doing then they are willing to pay good money to get it done. However once that work’s been done, or is no longer required, then employers see no reason to retain people. Why would they? After all they’re in business to make money. So be realistic and take a pragmatic view. That way you won’t be disappointed. Let’s be fair, the company’s approach is no different than the one we’d take as individuals. If we need our house painting, we hire a painter and decorator. Our house gets painted and when the job’s been done we pay the painter for the work completed. We don’t start worrying about the painter’s job satisfaction or career development. The psychological contract between us and the painter ends when the bill has been settled for the work completed. That’s the way it is. Simple. So why should we expect our employers to be any different? Companies are not charities or job creation schemes. Commercial companies have to make a profit, if they’re to grow and survive, and costs have an impact on profit, obviously. The psychological contract we have with our employer is one where we do stuff for them and then we’re paid for our efforts at the end of each month. We’re the hired help and once we’ve been paid that’s where the psychological contract ends as far as our employer is concerned. Your employer will not spend his or her time worrying about your aspirations or your dreams. Once again, it would be naïve to think otherwise. Commercial reality whether we like it not is that all companies exist to make money for their owners. It’s that simple. Why would anyone start a company for any other reason? So if you think that your loyalty will be appreciated by the average employer then I think you’re either mistaken or deluded. Employers will take everything you give and a bit more besides, but once you’re no longer required they will be as ruthless as they have to be. If they weren’t able to be ruthless when necessary then that could put the whole company and the jobs of everyone involved at risk. So there’s a good business reason for the way companies tend to operate. Furthermore we don’t spend our money unnecessarily, so why should we expect a company to be any different? From time to time you’ll meet leaders of real stature and class who will treat you very well. However they’re the exception rather than the rule. Most senior executives are driven only by self-interest. Once you’re no longer of use, they will be as ruthless as they have to be. That’s the way the world works, so don’t expect it to be any different for you. The point I’m making is that you must be ruthless too. You must look after your own interests, constantly. It’s perfectly reasonable for you to be working with your own agenda in mind. Deliver the results for which you’re being paid of course but always with one eye on your own best interests. In any job you should make sure that you know what you’re meant to be doing and what you’re meant to be delivering. What you’re delivering must add value. You should know what that value is and you should be confident that it’s not something that can be done by a machine. If it is, then the chances are that one day it will be and you will be out of a job. Never do anything out of a misplaced sense of loyalty because that loyalty is unlikely to be reciprocated. At work you have to be very business-like in everything you do. The name of the game from your standpoint is to earn a living. If it’s not obvious to you what your contribution is meant to be then you should start to worry. If you cannot explain what you’re meant to be doing in a couple of lines then it’s time to move on. If you don’t know what you’re meant to be doing then the chances are that your boss is wondering too. And once your boss starts to question your role then there is a risk that it won’t be too long before your job is eliminated in a future cost-saving exercise. Remember this: No one owes you anything. Life is what you make it. As I said earlier, you’re the captain of your own ship. You should be steering that ship in a direction that suits you and your ambitions. Steer the good ship ‘Me’ in the direction you wish to go and not in the direction someone else wants you to go. You should be working to your own agenda and within the framework of your own plans. If you think your employer has plans for you then you’re fooling yourself. You will only figure in your employers plans for as long as it makes good business-sense for them to include you in those plans. If they can’t see how you’ll add value to their plans then a parting of the ways might not be far away. You may make mistakes occasionally and you may do things for employers which for whatever reason come back to bite you. If you do, don’t worry. Just learn any lessons from the experience and move on. Lessons learned are far more valuable to you than anything someone else can tell you. That commodity based on life’s lessons is known as experience and it’s a very valuable commodity indeed. Take every opportunity to broaden your experience and grow. Work harder on yourself than you do on your job. The more you have to offer the more employable you’ll be and the greater will be your financial rewards. Never expect loyalty from your employer and you won’t be disappointed. You’re not indispensable and neither is anyone else. If you weren’t around then someone else would be hired quickly and the business would move on. And in all probability you’ll soon be forgotten. The chances are that someone else will take the credit for any significant contribution you’ve made but you’ll probably take the blame for everything that’s wrong, including things in which you had no involvement at all. If you look after your own interests then your achievements will be all yours and you’ll be on the road to success. You have to carve out the success you want; no one else will do it for you. Add real value to your employer for as long as you can or for as long as it makes sense within your own plans for you to do so and then it’s time to move on to the next opportunity. Don’t get overly sentimental; you’ve got to be as ruthless with your employer as they would be with you. It’s perfectly reasonable to work to your own agenda, and that’s exactly what successful people do. Never underestimate the value of reading and continual learning. The more you read, the more you learn and the more you learn the greater will be your value. Read one good book related to your work or personal development each week and over a year that’s the equivalent of a PhD’s worth of knowledge gained. Increase your knowledge by that amount every year and you’ll be light years ahead of your colleagues. Increase your value and you increase your ability to earn more. And what’s not to like about that? Now I’d be interested to hear what you think dear reader. 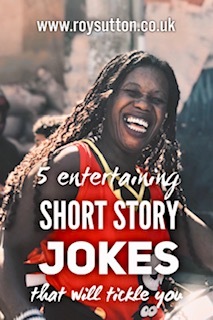 I’d love it if you could share your own experiences with other readers. If you’d like to add your own views about the world of work then please feel free to add your comments below. You’ll be helping your friends and you’ll be helping me too. So you really can make a difference to the lives of others. Your life on earth timeline; what’s it all about? If you’re lucky enough to have one good friend then you are richer than you imagine and if you have two then you’re truly blessed. Friendship is a relationship of equals. Real friends are people with whom you have a lot in common, especially when it comes to things that make you laugh and those times when you enjoy getting silly. True friends are people who know all your faults but accept you as you are anyway. 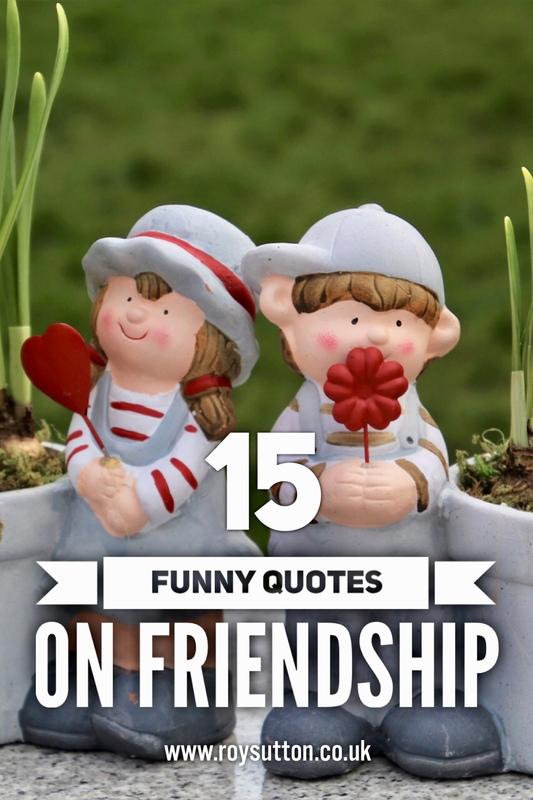 Not everyone with whom you have a friendly relationship is a true friend. Some people are just very good acquaintances. A real friend is someone you could phone at 3am, when you’re in trouble and know they’d be out to help you in a heartbeat. Such people are worth their weight in gold and you should never take them for granted. They’re special and you should appreciate them being in your life because not everyone is quite so lucky. 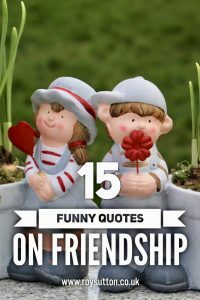 Here are 15 funny quotes on friendship that for me touch on the very essence of what it all means. Friends are the chocolate chips in the cookie of life! When our phones fall, we panic. When our friends fall, we laugh. If you have crazy friends you have everything you’ll ever need. Never let your best friends get lonely. Keep disturbing them. You have a problem when your imaginary friend thinks he has a problem. There’s nothing better than a good friend, except for a good friend with chocolate. Friends come and go, like waves on the ocean, but the true friends stay like an octopus on your face. A best friend is like a four leaf clover, hard to find, but you’re lucky if you have one. I’d walk through fire for my best friend. Well, not fire because that’s dangerous, but a super humid room. Well not too humid, because you know, my hair. I love making friends. I usually prefer to make them out of plaster and give them funny looking hats. Dear Diamond, we all know who is really a girl’s best friend. Sincerely yours, Chocolate Cake. I hope we’re good friends until we die, then I hope we can stay ghost friends, walk through walls and scare people. Looking for some inspiration? Perhaps some quotes to inspire and energise you or something that will provide a little impact for the end of a presentation? 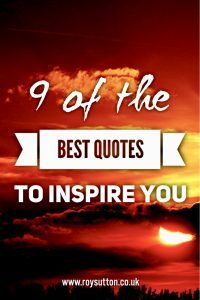 Here are nine great quotes which I hope will motivate you for the challenges you face in the days to come. 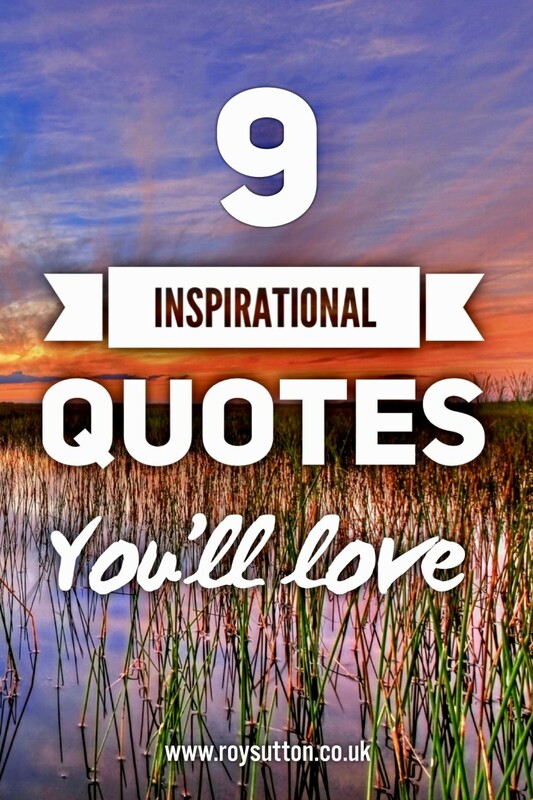 Inspirational quotes from some of the finest philosophical thinkers ever. They all left me inspired and I’m confident that you will love them dear reader. 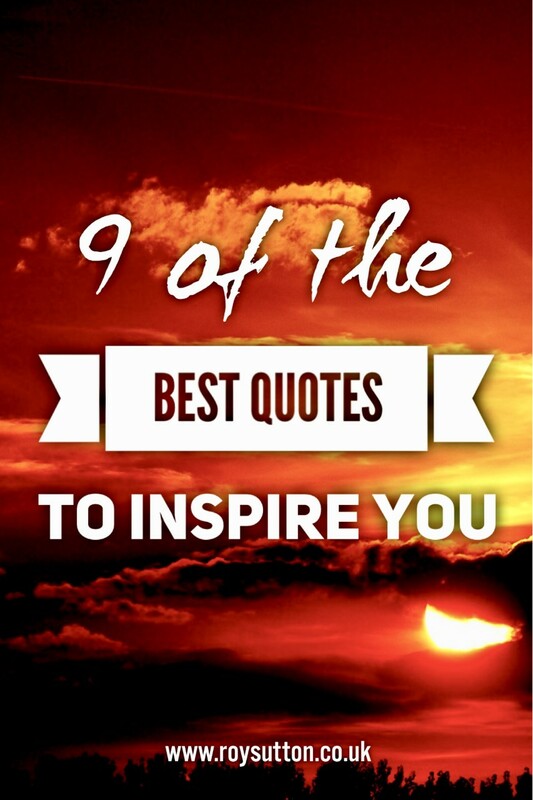 Here are 9 of the best quotes to inspire you. These are quotes from thought leaders intended to make you think. They are words of wisdom full of inspiration. Inspiration is energy and if you can capture that energy you can go on to become all you could be. And that should be our life’s purpose, surely? To be all we could be. If you aspire to be more than you are now then let these words of wisdom be the wind beneath your wings. As you may recall dear reader, I’m always looking for great quotes, especially those that really get me thinking. 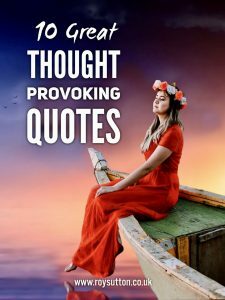 Just recently I’ve collected a batch of what I think are some great though-provoking quotes and so I thought I’d share them with you. All of today’s quotes fall within the category of ‘Author Unknown‘ unfortunately but they’re still worth a few moments of your time. So here’s some brain food to get your day started. 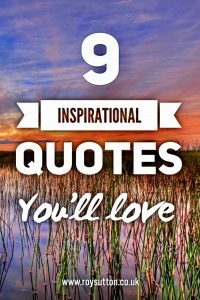 I think some of these quotes are real gems, so I hope you find them interesting. If silence is golden, not many people can be arrested for hoarding? If ignorance is bliss, why aren’t there more happy people? If you enjoyed these quotes do let me know which one you thought was the best. All too often nowadays people use profanity as a lazy and ill-considered form of expression. And rarely does it reflect well on anyone in my opinion. 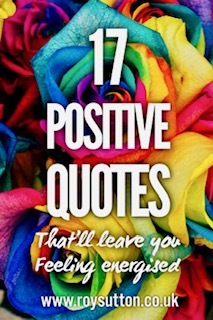 Do you enjoy positive quotes? 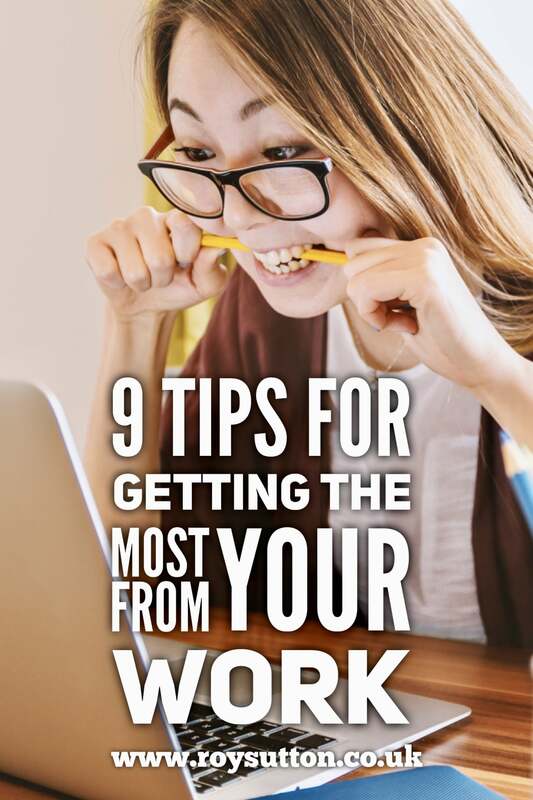 Perhaps you’re looking for something either because you’re in need of a little inspiration personally or because you have an audience to inspire? Possibly you have a presentation to prepare and consequently you’re in need of some positive quotes to reinforce the points you wish to make? Words are powerful and positive quotes can have great power. As a result they can lift you and they can lift an audience too when chosen well. Yet the power of words is not always appreciated in the way it should be. Therefore here are some positive quotes which I’m confident will inspire you and they will rock any presentation in which they’re used. So please feel free to quote any of them if you feel they’ll help. However always acknowledge the author when known. All of these words of wisdom will make you think and they will make any audience think as well. Life can be hard of course and achieving success can be harder. However it can be done and people do. You just have to believe in yourself. A little help from some positive quotes won’t hurt though. 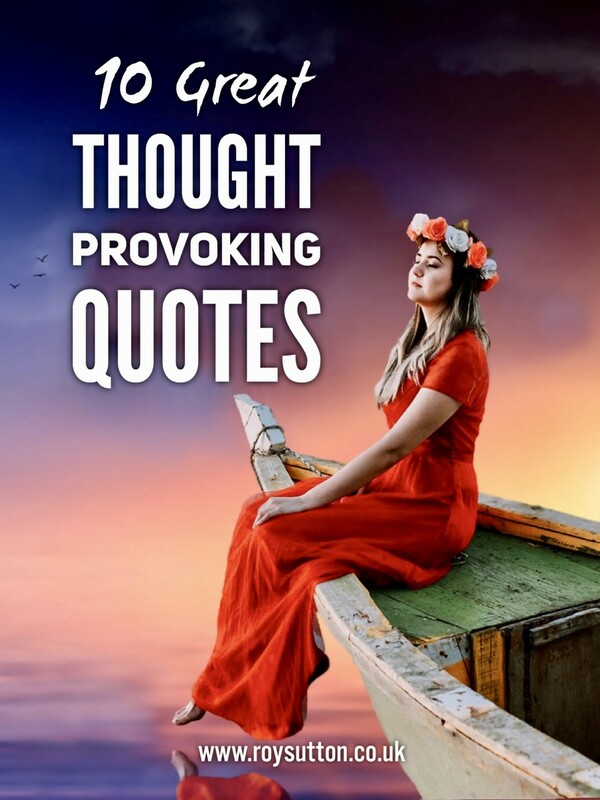 So read these positive quotes and inspirational words from so many of the great thinkers and they might just propel you in the direction of the success you desire. If they do help you in your quest, I’d be interested to hear your feedback. Feedback from readers is always appreciated. Being all you can be is a constant challenge. With any challenge, to ensure you don’t burn out, you also need time to relax. If you enjoy positive quotes then here’s a great way to turn that interest into a de-stressing hobby. Adult colouring books have become a popular way to de-stress. This offering from Jade Summer will allow you to enjoy a series of positive quotes and inspirational words whilst you show what you can do with colour and art. You can take a look at this product if you just CLICK HERE now. DISCLOSURE: Please be aware that there are Amazon affiliate links in this post. So should you make a purchase via one of my links then I will receive a small commission from Amazon. There will be no extra charge to you as the purchaser. These commissions serve only to pay for the upkeep of this website. Your understanding is appreciated. Thank you.